Solidium has been working towards more responsible ownership for more than five years. From the start, our efforts have been based on the view that proper management of corporate responsibility is a key requirement for creating successful businesses and long-term financial value. The importance of corporate responsibility has increased in these past five years. A growing number of companies have incorporated responsibility in their management practices. At the same time, the spectrum of responsibility themes has broadened. Today, corporate responsibility is looked at from a far more specific angles than before. Some of the specific themes include human rights, supply chain management, carbon footprint, as well as matters concerning information security, freedom of expression and privacy protection. As an owner, also Solidium must be able to manage a more extensive range of increasingly in-depth responsibility themes. Many stakeholders of companies now consider the responsibility and sphere of influence of corporations to be more far-reaching than before. One explanation for this boost in activity is the increased communication opportunities through, for example, social media. Therefore, companies must define in greater detail how to manage and organise their stakeholder engagement. They also must engage in high quality dialogue covering an increasing number of corporate responsibility themes. By means of sufficient and extensive stakeholder dialogue, companies can anchor their operations in the surrounding society and also collect signals that help them develop their own operations. During the past five years, Solidium has established itself in the Finnish arena of responsible ownership and investment. We have a solid approach to what we do. Solidium’s mandate as an owner is our most important and far-reaching channel for contributing to responsibility. Our objective is to grow the financial value of our holdings over the long term. Corporate responsibility is a good angle when assessing holdings and seeking value growth. It is also part of good governance. Corporate responsibility is relevant to the competitiveness of companies in many ways. Traditionally, corporate responsibility emphasises risk management. Nevertheless, it is also possible to build new business on the requirements arising from the need for sustainable development. The strategic importance of corporate responsibility matters varies widely among Solidium’s portfolio companies. In part, this is a question of the relevant sector and of how global the company’s operations are. In companies which build new business on responsibility trends, corporate responsibility is a strategic matter by default. In addition, the companies’ own history and traditions in responsibility matters define the needs of corporate responsibility efforts today. 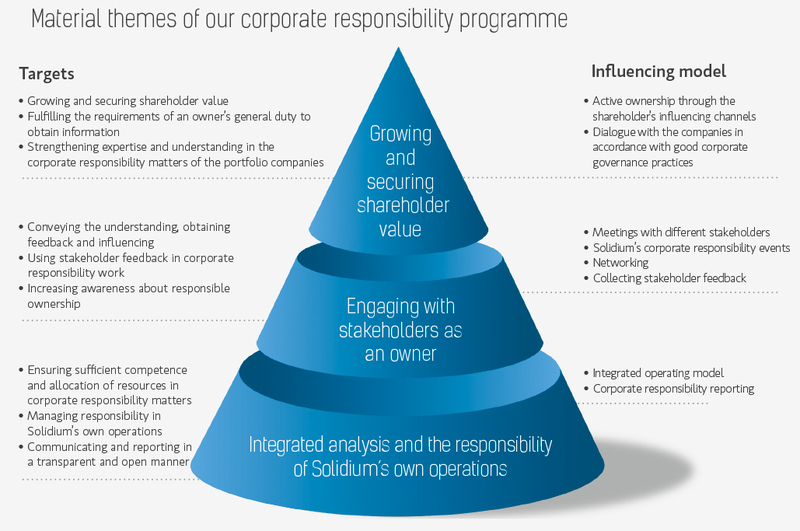 As a responsible owner, Solidium finds it important to identify the key corporate responsibility issues in each company and their potential impacts on shareholder value. The impacts may be positive or negative, and they may materialise directly or indirectly. The timespan of the realisation of the impacts may be long or short. It is also important for us to assess the preparedness of our portfolio companies to manage responsibility, in other words, the sufficiency of their corporate responsibility resources in relation to their needs. However, it often takes a crisis to see the true extent to which corporate responsibility is integrated in the corporate culture. We frequently discuss corporate responsibility matters and the state thereof with the management of each company. The focus of these discussions is on responsibility matters central to shareholder value. The owner must also be aware of possible emerging challenges in corporate responsibility. We bring up our views and expectations as an owner in these discussions. The corporate responsibility issues of portfolio companies can become so extensive that they impact shareholder value. We work to influence any shortcomings using the channels available to an active shareholder. Analysis, dialogue and influencing are frequent, recurring processes in responsibility. This interaction has a solid foundation in the responsibility analysis, which we conduct regularly on our portfolio companies. Corporate responsibility is an integrated part of Solidium’s operations. Our corporate responsibility work is monitored by the Board. Leading and developing the work is the task of one of the Investment Directors in addition to her own duties, assisted by an internal coordination team. The investment team of each portfolio company is in charge of carrying out a responsibility analysis. The Investment Director and investment teams report to the CEO with respect to their work. The long-term corporate responsibility programme approved by Solidium’s Board of Directors for 2013–2016 provides a framework for the company’s responsibility work. The objective of the programme is to support Solidium’s mission to grow the fi nancial value of its holdings over the long term, and it strengthens the operating model of responsible ownership. Its purpose is to fulfil the requirement of an owner to be knowledgeable and to enchance the value growth of the portfolio companies. The programme’s measures and objectives have been captured in material themes, which are: growing and securing shareholder value, stakeholder engagement as an owner, integrated corporate responsibility analysis, and the responsibility of Solidium’s own operations. In the following, the measures taken during the past nancial year are discussed in light of these themes.